Okay, so I do still take have to it out of the hoop, add my signature (the one you can see is just pasted onto the photo) and get it ready for putting into a mount. But the stitching is done, and I must say I am rather pleased with how it came out. I put the last stitches in on the first of February, so it doesn’t quite count as a January finish, but it’s still the first finished piece of the year. The background fabric looks too blue in this photo. It’s white Egyptian cotton from Empress Millls. The rest of the colours are about right in the photo – perhaps a little dark, but not far off. I’m still at the “gosh, did I really do that?” stage right now. I remember being in this happy state after the last time I used this same design. That was my first attempt to use Chinese silk in this way. Looking at the two together now, I can see that I have learnt rather a lot about this sort of stitching in the intervening time. Which is what it is all about, isn’t it? Maybe in a couple more years I shall have a similar amount of progress with silk? It would be nice to think so. That’s the joy of creative crafts: there is always more to learn, more to find out, more to figure out, more skills to perfect. I have also been working on the stitched box that I mentioned in my last post, but as I have only been doing the other base side pieces, there’s nothing worth showing you this time. Now I shall have to decided what design to put on the lid. I am am also thinking about my next ‘big’ project, which might well be another dragon. I have also got the urge for some more counted work, but my thinking hasn’t gelled on either of these subjects yet, so I shall get on with small things, experiments and the box while I am thinking. I mentioned that I had put the photo-art app Prisma on my phone. I have been finding it surprisingly useful for looking at my embroidery, and at subjects that I have in mind for embroidery. I think I will be using it for that purpose more than for making ‘art’ directly. Sometimes playing with the colours and textures, tones and edges can show up the weak and strong points of a design far more clearly than any amount of looking at the actual thing. It can also suggest different ways that designs might be tackled. Here’s a very bright and colourful version of Dragon, for example. I am rather tempted to try this scheme on a project – it would certainly make for very cheerful stitching! 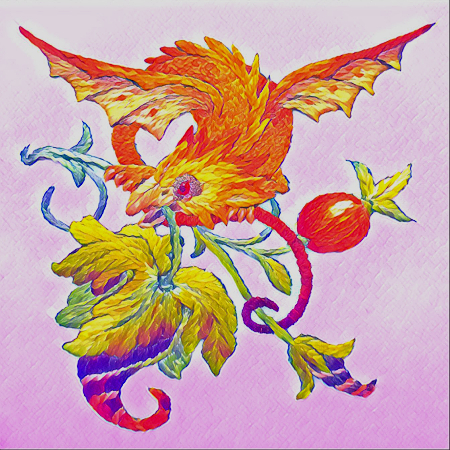 This entry was posted on February 3, 2019 at 3:56 pm and is filed under Embroidery, Needlework, Uncategorized with tags dragon, Embroidery, happy stitcher, Prisma, stitchery. You can follow any responses to this entry through the RSS 2.0 feed. You can leave a response, or trackback from your own site. Thank you, Tanya. 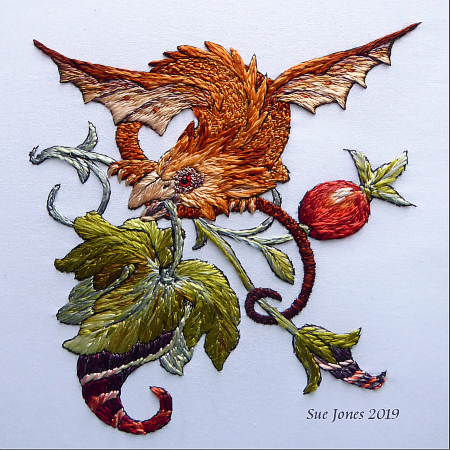 I was looking at a photo of that little sea-dragon I did on your stitchalong today, remembering how much fun that was. That turned out really lovely Sue! Well done you! Turning a design or image into greyscale is a great way to see how well it really works. Yes, greyscale is very good for tonal balance. (The old trick of nearly-closed eyes does the same job.) I was more interested to see how the pure-colour version showed up the colour balance. I find the nearly-closed eyes doesn’t work for me – I must be overly aware of colour! Maybe he is a wyvern? I am no expert and he wouldn’t tell me. Glad you like him. Stunning work! You have every right to be extremely pleased with yourself. Thank you. He will be a hard act to follow, but I am looking forward to my next silk project. I haven’t decided what it is to be yet.